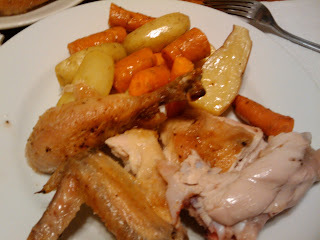 Hungry Kat: The Best Roast Chicken I've Ever Tasted! My parents (and most Chinese immigrants) always complain the chicken meat in the U.S. has no flavor and don't taste like chickens because it's never fresh at the supermarket. 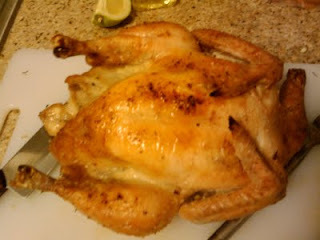 So, I've always wanted to try roasting a whole chicken using a fresh-killed chicken. Lily's Eggs at the Santa Monica Farmers Market on Wednesdays is my favorite place to buy fresh, free-range chicken, quail and duck eggs and Lily's also sells free-range chickens that are killed the day before and never frozen. 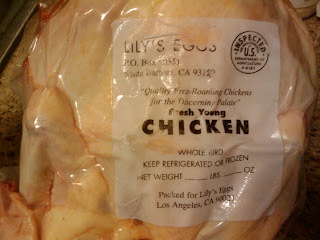 This past week, I was finally able to visit the market early enough before Lily's sold out of her free-range chickens. The chickens are killed on Tuesdays and then sold at the market on Wednesdays. It's cleaned and vacuumed-packed. 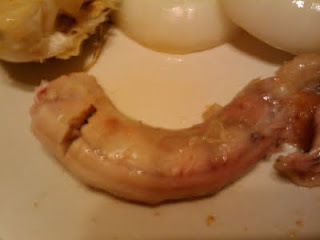 Unfortunately, they threw away the gizzard, liver and heart; that's the good stuff that I wanted to roast along with the chicken. 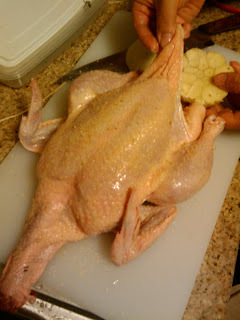 -Wash the chicken (the inside cavity too) and pat dry with paper towels. -Sprinkle garlic salt or kosher salt very liberally all over the chicken and inside the cavity too. -Slice the onion and head of garlic in half and peel away the onion/garlic skins. 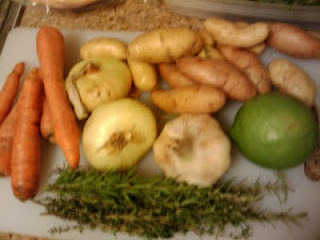 -Stuff the onion, half of the garlic, and a few fresh sprigs of thyme (I used rosemary too) inside the cavity. -Use kitchen string and tie the chicken (Google this to learn how; I'm still learning to perfect this technique). Brush the chicken with 1 to 2 tablespoons of melted butter and place the chicken breast-side up on a rack on top of a foil-lined pan. The butter will help keep the chicken skin moist and give it a nice golden hue. Then, you can either lay sliced potatoes and carrots around the rack or roast them on a separate pan. I threw caution to the wind and decided to roast them on the same pan so the potatoes and carrots can cook in the dripped chicken juices and fat. Don't forget to sprinkle a little salt over the potatoes and carrots and if roasting on a separate pan, drizzle some oil on them. Roast the chicken for about 60 minutes (time varies depending on chicken size and I think my chicken was around 4 to 5 pounds) and try to take it out quickly at the 45 minute mark and flip it so the skin on the other side gets a chance to crisp as well. You can check whether it's done if the juices run clear when you cut between the leg and thigh or if you have a meat thermometer, insert it into the inner thigh area and the chicken is done when it reads 165 degrees (note: instant-read thermometers cannot go in oven from the beginning). Let the chicken rest 15 to 20 minutes. Remove the stuffing, then cut and serve. 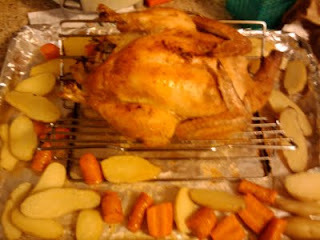 Most delicious Roast Chicken ever! You won't be able to resist devouring the crispy skin. Give it a squeeze of fresh lemon juice if you like. The chicken's neck, roasted. This, along with the wings, is the best part. I wish bars would serve roasted chicken necks. It's the perfect bar food (in my heaven). I know you can also get fresh-killed chickens at a chicken shop in Chinatown (on Broadway Ave., diagonally across from Cathay Bank) and there are a couple of places in San Gabriel Valley (one is on Garvey Ave). I can see the shops in my head but for the life of me, I cannot remember the names of the places. Ranch 99 supermarkets will sometimes have fresh-killed chickens too. However, it's just so nice to have Lily's Eggs as a source on the Westside. Thanks for the tips on getting great chicken in LA. The recipe sounds great, too! I think there is also a chicken shop on Virgil near Beverly, one on Vermont south of Wilshire a couple of blocks and one on Washington west of Alameda.